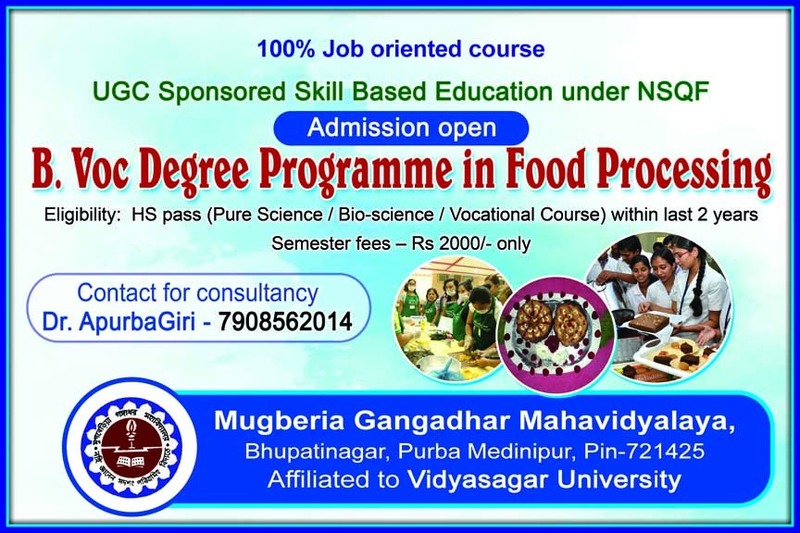 Advertisement for the position of Junior Research Fellow in a WBDSTB funded research project at the Department of Mathematics, Mugberia Gangadhar Mahavidyalaya. Registration Form of One day National Seminar on Environmental Hazards and Waste Management on 28th August, 2018.
" THE COLLEGE HAS BEEN RE-ACCREDITED BY NAAC AND HAS BEEN AWARDED B+ GRADE WITH CGPA OF 2.71 W. E. F. 01.04.2019 ". The college is a treasure trove, a citadel of learning. Ours is a college amidst verdant tranquility, far away from the madding crowd of urban existence. Education, we believe, is to express oneself and to find answers to eternal questions through the process of self exploration. Our commitment is towards the upliftment of the society and the betterment of the masses. Our mission is to achieve perfection of that manifestation of divine which is already latent in man. Hence it is a collective venture where co-operation from all concerns is highly solicited. 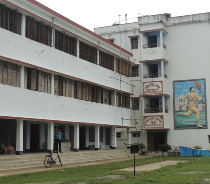 Mugberia Gangadhar Mahavidyalaya was established on 2nd of July, 1964 as a co-education college by a society of the same name in a village in Contai Subdivision of Purba Medinipur District (Erstwhile Midnapore District) after the name of Medinipurs pride - Late Raisaheb Gangadhar Nanda - a great lover and patron of education.The college is situated in a culturally rich locale, and it is the only college in the vast area of Bhagwanpur-II block. It was founded with the help of the donations collected from the local people with the aim to serve the poor inhabitants of the area who were unable to send their wards to distant places for higher education. It is noteworthy that some eminent people, enthusiasts in education and social work, took the initiative in establishing this college. Notable among them are Shri Jyotirmay Nanda, Shri Hrishikesh Gayen, Shri Rammay Nanda, Shri Biswanath Sarangi, Shri Tarapada Maity, Shri Sudhir Kumar Hazra, Shri Rakhal Chandra Sarangi, Shri Nanda Gopal Maity, Shri Bankim Chandra Hazra, Shri Ajit Kumar Paria, Shri Jogesh Chandra Nanda, Shri Jagattaran Tripathy, Shri Sachikanta Nanda, Shri Satish Chandra Manna. An workshop on ICT will be organized on 27th September 2018 Thursday in the Shatabdi Sadan Auditoriam at 1130am. Allthe members of teaching faculty, nonteaching staff and the students of M.A. Bengali, M.P.Ed and M.Sc. Mathematics are cordially invited to attend the same. 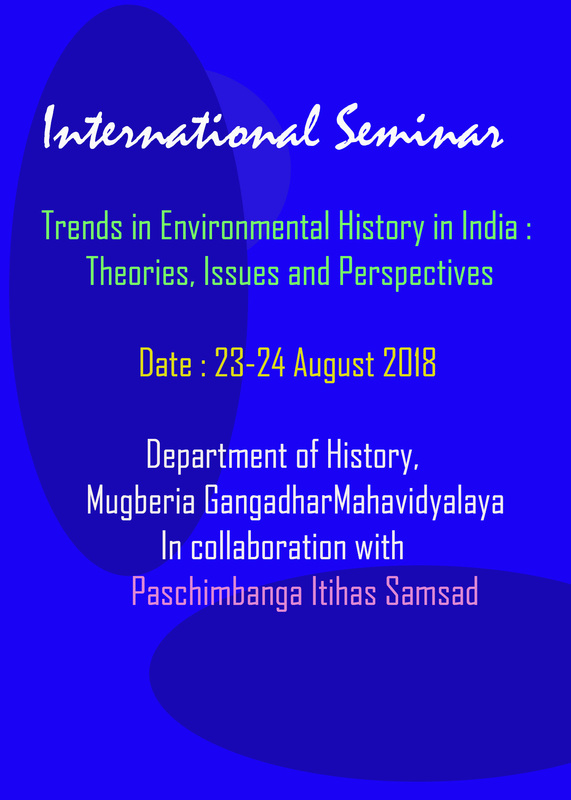 Department of Zoology of Mugberia Gangadhar Mahavidyalaya is going to organize a National Level Seminar on 28th August, 2018 on Environmental Hazards and Waste Management.